This past Sunday, I had the opportunity of attending a performance by local rock band from Queens, New York, Winds & Walls. The band's website is currently under construction. I'm currently working with Omar Feliciano, the band's rhythm guitarist to get the site up and running at windswalls.com I grew up going to high school with the band's rhythm guitarist, Omar Feliciano. We use to learn guitar together and eventually, he ended up going full speed with his music aspirations while working as a research assistant during the day at a local college. Overall, the band's music reminds many of us who grew up in the 2000's of the alternative, punk rock style type of sound. The music video of their latest single, Hindsight is amazing. Professionally done and definitely great vocals from lead singer Rosie Posadas. Below is their video "Hindsight" from Youtube. New York Comic Con was a blast this past week and this year's turnout was huge! Excellent guests and panels. Had the opportunity to Jessica Nigri and Jason David Frank. Jessica Nigri was awesome! She has a great personality and enjoys her fans. My wife and I was able to take a picture with her and get an autograph. Thanks Jessica ! Jason David Frank (aka Tommy Oliver the Green Ranger from Mighty Morphin Power Rangers) was also at the New York Comic Con from Friday, October 11 to Sunday, October 13, 2013. My wife and I were able to meet with him today during his autograph session and get a picture with him. He loves his fans and got everyone singing the Power Rangers theme song when he arrived at the Jacob Javits Center. We also gave him a present for his daughter Jenna which is a hair bow with the Green Ranger on the button that my wife created. He also helped us by promoting the image on his Facebook Fan page at the Jason David Frank Official Fan Page. Thank you Jason and hope to meet you again next year at the New York Comic Con !! Although this year's New York Comic Con is in the books, I'm looking forward to next year. Can't wait to see what other panels will be there and looking forward to seeing my favorite guests like Jessica Nigri and Jason David Frank again ! This week, Mighty Morphin Power Rangers turns 20 after reading this article from Time Magazine. This was also a mentioned on Jason David Frank's Official Fan Page . Jason David Frank played Tommy Oliver who was the Green Ranger on Mighty Morphin Power Rangers. He is also currently in talks about a Green Ranger solo movie in an interview with IGN . I think this will be a fantastic idea to see a Green Ranger movie. The Green Ranger can indeed have a success as being his own brand. 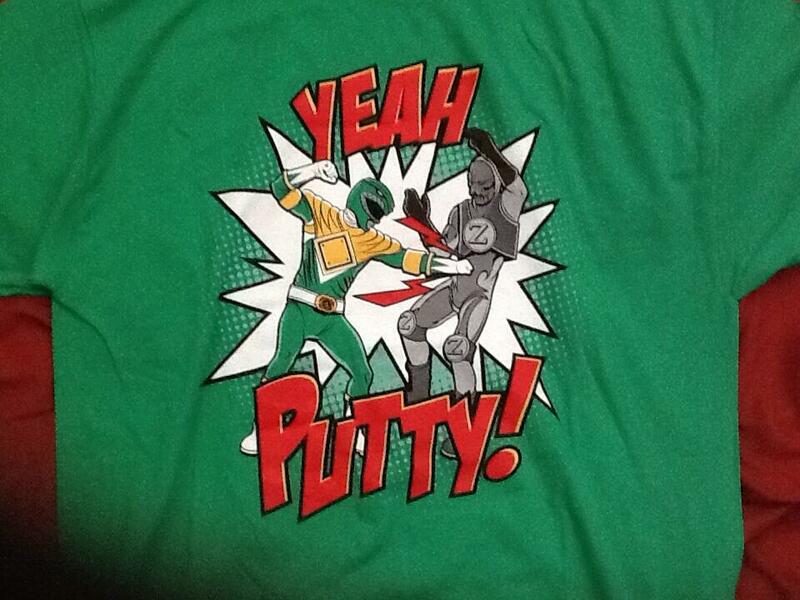 Speaking of Green Ranger....I just received my Green Ranger shirt in the mail today after placing the order through Jason David Frank's Official Fan Page on Facebook. I'll be wearing this shirt to New York Comic Con in October. Until next time...below is a picture of my shirt that arrived in the mail today.